Isn’t it annoying to have your lawn littered with twigs, leaves, and debris whenever you’re done mowing it? Don’t you wish you could easily sweep them away and clear the lawn? In this article, we’ve given you a detailed overview of the 5 best lawn sweepers 2019 that can do just that. Introduction: Do you get annoyed with all of the leaves, twigs, and debris that are left behind after you’re done mowing the lawn? Most people have to manually collect all of the debris to dispose of it, and that’s quite a time-consuming process. However, you can simplify the process greatly with the help of a lawn sweeper. A lawn sweeper is basically like a vacuum cleaner for the yard. It’s used to clear the lawn and collect debris, twigs, clippings, and anything else that might be lying around. Lawn sweepers come in two major types — the kind that’s pushed from behind, and the kind that’s towed in hand. 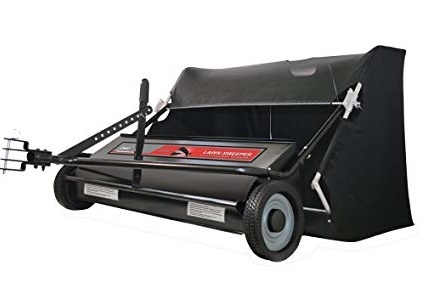 The pushing type of lawn sweepers come with a handle, and the towing sweepers are hooked with a handle to tow across the lawn. There are brushes attached at the bottom of the lawn sweeper. As such, when you push or tow the lawn sweeper, the brushes start spinning and the centrifugal force generated scoops up all of the debris from the ground. This debris is then emptied into a separate bag for disposal. There are a number of different lawn sweepers in the market, and several different brands that you can choose from. In fact, for a novice buyer, the choices can get overwhelming and confusing. That’s why we’ve compiled this list of the top 5 best lawn sweepers in the market. In order to compile this list, we’ve vetted and examined dozens of the best lawn sweepers in the market. We’ve also consulted with landscapers to help us decide which lawn sweeper is the best. In the following article, we present all our findings. The Agri-Fab 45-0492 Lawn Sweeper is widely considered to be the best pull lawn sweeper in the market in terms of strength, durability, and reliability. It’s also extremely easy to assemble and can be done within 30 minutes if you follow the instructions carefully. 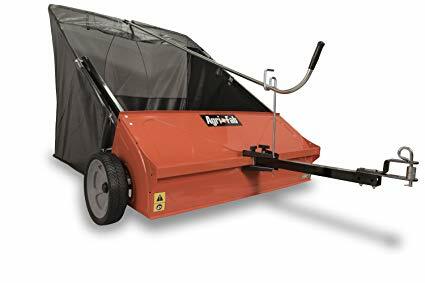 One of the best features of this lawn sweeper is the mesh back “flow thru” hopper which is twice as voluminous as other hoppers out there. As such, you can cut down the need to empty it by half. Emptying the hopper is often cited as one of the greatest nuisances of lawn sweepers as it greatly increases the time taken to complete a project. As such, while the Agri-Fab 45-0492 doesn’t get rid of that nuisance altogether, it does make it twice as efficient. The Agri-Fab 45-0492 also comes with a pull button brush height adjustment feature which ensures that you’re using the lawn sweeper in the ideal height position. As such, it cuts down the need for you to manually adjust the height. Furthermore, the sweeper tongue has the ability to both cut and sweep simultaneously, making it far more efficient than most designs. You can also adjust the lever directly from the tractor without having to get off, thus reducing the amount of time it takes to get the job done. Storage is always an issue when it comes to large objects like lawn sweepers. However, the Agri-Fab 45-0492 can be folded up and stored in a compact space. As such, it’s easier to store and more portable than other lawn sweepers. 12" x 3” size wheels. 25 cu. Mesh Back hopper. Brush to Wheel Ratio of 5.6:1. Can sweep a large area relatively quickly. Several customers have complained that the instruction manual is difficult to understand. Some users also claim that the brushes aren’t powerful enough to collect large debris. The Agri-Fab 45-0492 is the best pull lawn sweeper in the market for both mowing and sweeping large lawns efficiently in a short period of time. 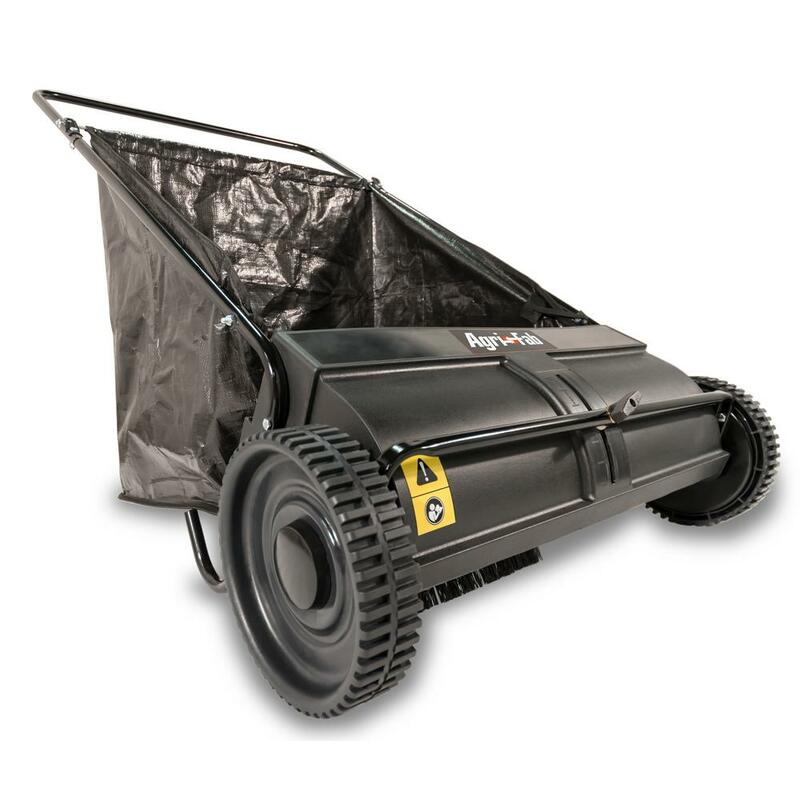 The Brinly STS-427LXH is one of the most durable tow-behind lawn sweepers in the market. It comprises 6 high-velocity brushes that can be manually adjusted to the ideal height to enhance the efficiency with which the lawn sweeping is done. It has a large 20 cubic foot hopper so it doesn’t require frequent emptying. It’s not as large as the Agri-Fab 45-0492. However, it’s pretty large and voluminous in its own right. Furthermore, its also accompanied with a 42-inch sweep so that you can simply go over an area once and collect the debris. You don’t require several repeated passes. It’s designed in a minimalist style that allows it to stand upright as well. As such, you can store it vertically in a corner of the room so it doesn’t take up much space. 6 high-velocity brushes with indexed height adjustment. The hopper is voluminous and doesn’t require constant emptying. Sweeps large amounts of uneven terrain. The Brinly STS-427LXH is an extremely efficient tow-behind lawn sweeper that can also scoop up larger pieces of debris on uneven terrain. The Agri-Fab 45-0218 is the most lightweight and budget-friendly lawn sweeper meant to be used for simple backyard cleaning. This lawn sweeper is definitely not as powerful or efficient as the ones mentioned earlier. 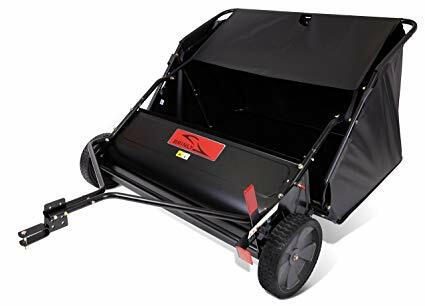 However, it’s far more reasonable, weighs just 25 pounds so it’s easy to push around, and that makes it ideal to be used for small lawn maintenance. It has a 26-inch sweeper width which is ideal for lawns up to 2000 m2 in area. 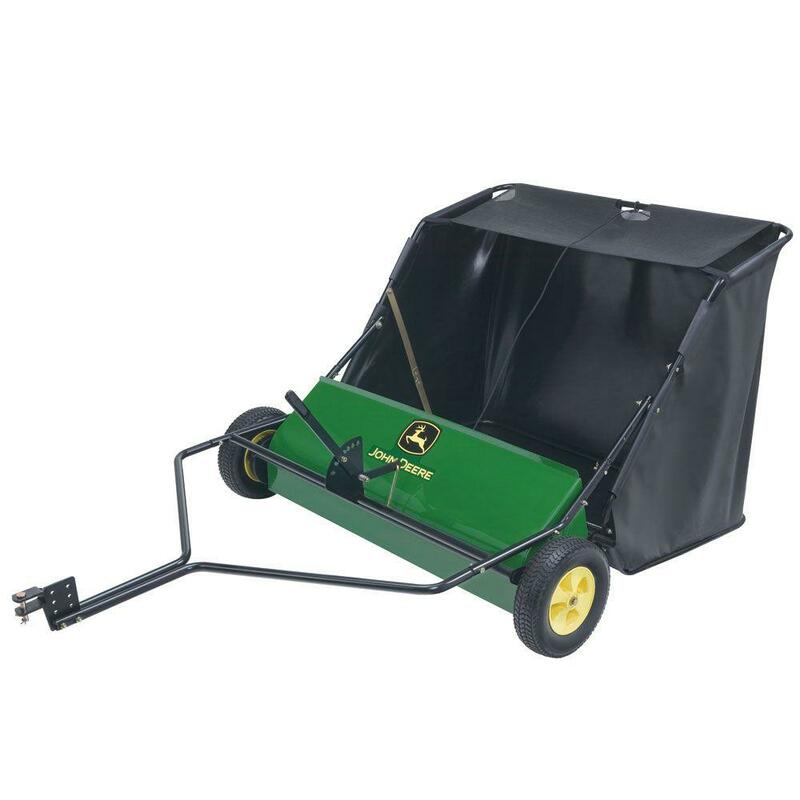 The product is made of a durable polypropylene housing and zinc-plated steel frame and it includes a vinyl bag with a volume of 7 cubic feet. Users state that this is a really efficient product for backyard cleaning and that it’s extremely durable. It can also be easily folded up to reduce the storage space required. 7 cubic feet collapsible hopper. 9.75” x 2.25” plastic wheels. Durable and can be used for several seasons. Some customers state that it’s difficult to assemble due to vague instructions. It’s not ideal for use on uneven terrain. The Agri-Fab 45-0218 is the best and most reasonable push-style lawn sweeper for use in backyards and small lawns. The John Deere Tow-Behind Lawn Sweeper is one of the most efficient tow-behind lawn sweepers in the market. It has a 24 cu. hopper volume, which is one of the largest hoppers in the market, thus drastically cutting down on the amount of time you have to spend emptying it. The sweeper width is 42 inches, making it ideal for large lawns and the velocity of the brushes is fast enough that it requires a single sweep to clean the lawn. This lawn sweeper can either be made to stand upright or it can be hung up on the wall. As such, you can store it either way and ensure that it doesn’t take up much space. Furthermore, unloading this tow-behind lawn sweeper is extremely easy and automated with the use of the pull cord. Can be stored upright or hung up. Pull cord for easy disposal of debris. Can also pick up acorns and pinecones. The wheel isn’t very durable. The John Deere Tow-Behind Lawn Sweeper is an extremely efficient and powerful lawn sweeper meant for large area coverage, however, it’s not highly durable or reliable. The Ohio Steel 42SWP22 is a powerful pull-style lawn sweeper. It features a 50-inch sweeping width, which is one of the largest in the market, making it perfect for large lawn-sweeping projects. Furthermore, with a 26 cu. feet hopper capacity, it can take in a lot of debris before needing to be emptied. The brushes in this product are 11 inches long and designed in a spiral-style so they can sweep a lot more debris, and faster. Furthermore, it can even sweep pinecones, acorns, and other larger debris. The 9” chute ensures that the gears don’t get clogged up as a result of larger debris. The only drawback of this product is that it doesn’t last very long and may fall apart soon. 11 inch long spiraled brushes. Can pick up large debris without getting clogged. The bag is poorly built. Extremely heavy and takes up large storage space. Not very durable in the long run. The Ohio Steel 42SWP22 is one of the most robust and powerful pull-style lawn sweepers in the market, however, it’s not very durable in the long run. In this part of the article, we’ll give you a detailed understanding of what lawn sweepers are, how to use them, safety tips, and factors to consider when buying them. There are two types of lawn sweepers in the market — Push Lawn Sweeper, and Pull Lawn Sweeper. The handle is attached at the rear end of this lawn sweeper. You need to take hold of it and push it across the lawn. This sweeper consists of a tow handle which is used to pull the lawn sweeper across the lawn. It’s largely used along with a lawn tractor. The handle is attached to the end of the tractor and you can drive it across the lawn. As such, a pull lawn sweeper is ideally suited for larger lawns. A leaf blower is often considered to be an alternative to a lawn sweeper as both their function is to get rid of debris. However, a lawn sweeper is far quieter. A leaf blower generates a lot of noise when being used whereas a lawn sweeper is mostly pretty quiet. A leaf blower has the tendency to blow the debris ahead. As such, you need to navigate the blowing leaves out of the lawn and in a single location from which they can be scooped up. However, a lawn sweeper simply pulls and collects all the leaves directly, making it more efficient. Leaf blowers cause a lot of pollution. In fact, they have such a negative impact on health and the environment that they’ve been banned from use in several countries across the globe. Lawn sweepers are an eco-friendly alternative. Lawn sweepers can also be used for large lawn maintenance. A pull lawn sweeper can be attached to the end of a lawn tractor to be able to clean up wide swatches of grassland quickly. Lawn sweepers can also be used alongside lawn mowers. Together, you can use the sweeper to prematurely collect the debris, thus enhancing the mower’s ability to mow the lawn without debris getting stuck in its blade. As such, a lawn sweeper helps enhance the lifespan of a mower. A lawn sweeper directly collects all of the debris into a disposable bag, thus making it the most convenient alternative out there. As a result, you can increase the aesthetic appeal of your lawn more easily. Lawn sweepers are safe to use. Using a lawn sweeper is extremely easy and it doesn’t place much of a pressure on your body. When do you need to use a Lawn Sweeper? A lawn sweeper is especially useful during Autumn as the lawn is generally littered with falling leaves that need to be cleaned off regularly. If you get a powerful lawn sweeper that can work on concrete, you can also use it to scoop out the snow during winter months. You can also use the lawn sweeper to clean the driveway during non-snowing months. How to use a Lawn Sweeper? Follow the instruction manual to assemble the different parts of the lawn sweeper. Hook up your pull or push lawn sweeper to the end of a lawn mower, if you intend to use them together. Now you can either push your lawnmower across the yard or tow it behind yourself. You can adjust the height of the brushes and the speed of rotation till you’re satisfied that it’s scooping up all the debris. Be sure to empty the hopper every time it fills up. Repeat pushing or pulling your lawn sweeper. As you can see, a lawn sweeper is fairly easy to use. However, you should know that it’s not capable of picking up large items like branches or rocks. As such, whenever you come across larger items, you should manually pick them up to prevent them from harming the brushes and the gears of the machine. Follow all the instructions in the owner’s manual accurately while assembling the sweeper. Examine the different parts of the machine every couple of months to ensure that they’re still in proper working condition. If one of the parts seems to be out of order or out of place, get it fixed before using the sweeper again. Ensure that the wheels of the lawn sweeper are inflated at all times. Carefully clean and oil the axle joints regularly so they work smoothly and don’t rust. The brushes should be screwed on tight to increase efficiency. Examine the brushes every time before use. If they’ve been worn out, you need to replace them. Empty the hopper before it fills up entirely. If you wait too long, it could develop a rip. If you’re afraid that your hopper might rip in certain areas, tape up those areas to enhance its lifespan. If you’re putting it away for the season, be sure to clean it thoroughly and oil it first before stowing it away. It’s likely that novice shoppers will get confused by all the different options in the market. There are a number of different types of lawn sweepers with differing features. Which one should you buy? Which one is right for you specifically? In this part of the article, we’ll list out some of the most important factors when it comes to buying a lawn sweeper. How do you Intend to use the Lawn Sweeper? The correct lawn sweeper depends on your specific use for it. Do you need it to sweep the grass in a moderate-sized lawn? Do you need it to also clean pinecones and other larger objects? Will you need to scoop up snow? How often do you intend to use the lawn sweeper? Will you use it on concrete surfaces? These are all important questions you need to ask yourself before buying a lawn sweeper. If you need to sweep large lawns with bigger chunks of debris, then you’ll have to go for a large pull lawn sweeper. If you need to use it for small lawns, a push lawn sweeper would suffice. Different sweepers will also be ideal for different surfaces. As we’ve already explained earlier, a lawn sweeper is available in a Push and Pull style. You need to consider the pros and cons of both types of sweepers and decide which one is better suited for your lawn. You need to make sure that the spare parts of the lawn sweeper are easily available on the market. It’s likely that you’ll have to frequently repair or service your lawn sweeper. As such, if you buy one with spare parts that are hard to come by, you’ll have to get rid of the sweeper altogether if it develops any issues. However, if the spare parts are easily available, maintenance would be a breeze! Lawn sweepers are available in a wide price range. You have extremely cheap ones and extremely expensive ones. You should first consider the features you need in your lawn sweeper, and then find a reasonable product that meets those specific needs. The cost of lawn sweepers might also differ depending on the store from which you’re buying them. As such, you should scout the market and find the best available prices. I hope you now have a strong understanding of what lawn sweepers are how to select the best one to purchase. To sum up, a lawn sweeper is a device used to sweep debris off a lawn. It can be used either individually, or in addition to a lawn mower or lawn tractor, and it’s available in two major types — Pull Lawn Sweepers and Push Lawn Sweepers. In this article, we’ve given you a detailed review of the 5 best lawn sweepers 2019 on the market. In order to compile this list, our team personally examined and vetted some of the most popular lawn sweepers in the market across a wide budget range. We also consulted with professional landscapers to ensure that our decision was the right one. Furthermore, we’ve also provided you with a detailed Buyer’s Guide to guide you with the use, maintenance, and selection process of the lawn sweeper. If you have any other questions, feel free to mention them down in the comments section.